Welcome to The Lighter Shop! 1000's of Zippo Lighters in Stock at Low Prices - FREE UK Delivery! 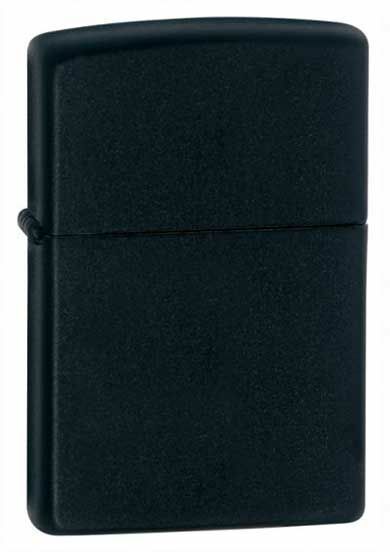 A matte black coloured Zippo lighter of plain design. One of our best sellers. Personalise This Zippo with An Engraving? Unlike other sites, all items on our site are from stock. 30 day return policy - Read More.. The Zippo lighter is a true American legend and has become known worldwide for its reliability and build quality. Due to the wide range of designs which Zippo have to offer, Zippo lighters have a strong following of collectors from all over the world. The Zippo was especially popular with the Military during World War 2 and the Vietnam War and over the years, has appeared in many Hollywood films. In its 80th anniversary year in 2012, Zippo produced its 500 millionth Zippo lighter. The Zippo story began in Bradford, Pennsylvania USA in 1932 when George G Blaisdell noticed a friend using an Austrian-made lighter. It's design was cumbersome, required two hands to use and the outer metal casing was thin and dented easily. He decided that he could make a lighter which was stronger, lighter, easier to use and more reliable. He then began work on designing & making what is now the Zippo lighter. In 1933 the first ever Zippo lighters went on sale in America and so confident was he in its design, Mr Blaisdell introduced the Zippo Lifetime Guarantee. The Zippo company is still a privately owned family run company, still based in Bradford USA which is now headed by the Grandson of George G Blaisdell. From the time of their first ever lighter going on sale in 1933, Zippo have always offered their Zippo Lifetime Guarantee on all of their windproof lighters and they stand by their promise. It states that if any Zippo lighter doesn't work, then they will fix it for free for its entire lifetime. If you had a Zippo lighter from the 1940's for example and it stopped working - you could send it back to Zippo and they will fix it. The guarantee covers mechanical repair and not cosmetic wear and tear (eg. dents / scratches & scuffs). We are currently offering a promotional FREE delivery rate on all UK orders. You can also choose faster delivery options for an extra charge. Delivery to outside of the UK will be charged at a higher rate. When you visit your checkout to pay for your order, you will be shown the delivery charges (if any) and you can then decide which option to take. Orders are normally shipped within 24 hours, Monday - Friday 8am - 5pm. Although most orders are received by customers within 2-3 days, we ask customers to allow up to 14 working days for delivery in line with Royal Mail policy, (although it's very unlikely it would ever take this long). Engraved orders are normally shipped within 24 hours, Monday - Friday 8am - 5pm. If you choose an express delivery option (Special Delivery), then we will engrave and dispatch the item the same day (Monday to Friday) provided the order is received before 12pm (noon) - although it is still possible to receive the item the next day if the order is placed after 12pm.. If you choose 1st class postage, we will aim to dispatch the order within 24 hours, even if it is engraved. Please note that Free Delivery and 1st class delivery are not guaranteed services and we cannot be held responsible for delays caused by Royal Mail, or by an incorrect delivery address. Special Delivery is a guaranteed service whereby Royal Mail guarantee delivery within a set timescale, provided that the delivery address is full and correct and that someone is at the address to sign for the package. We offer a 30 day return policy on all the products on our website. If you aren't happy with your purchase for any reason you can return it to us for a refund or exchange within 30 days. In the unlikely event that you need to return an item to us click here for return instructions. Some items can not be returned if they are opened. Merchandise that has been worn, used, or altered will not be accepted for return or exchange. We cannot accept lighters which have contained fuel so if you receive your item and need to return it, please do not fill it with fuel. Due to the one-off personalised nature of engraved items, we are unable to accept returns of personalised items unless there is an error (eg. spelling) on our part. We stock the entire Zippo lighter range and offer Zippo engraving at low prices with fast, FREE UK delivery. Copyright © 2018 TheLighterShop.co.uk. All rights reserved.